Recent Economic Developments Visualized In Graphs. Draghi's speech at Jackson Hole was different compared to his last speech at the ECB's governing council meeting. The ECB has a mandate of inflation just under two percent. What Draghi always underlines in this speeches is that, while inflation in the short run may deviate from the target, inflation expectations are at just below 2 percent. 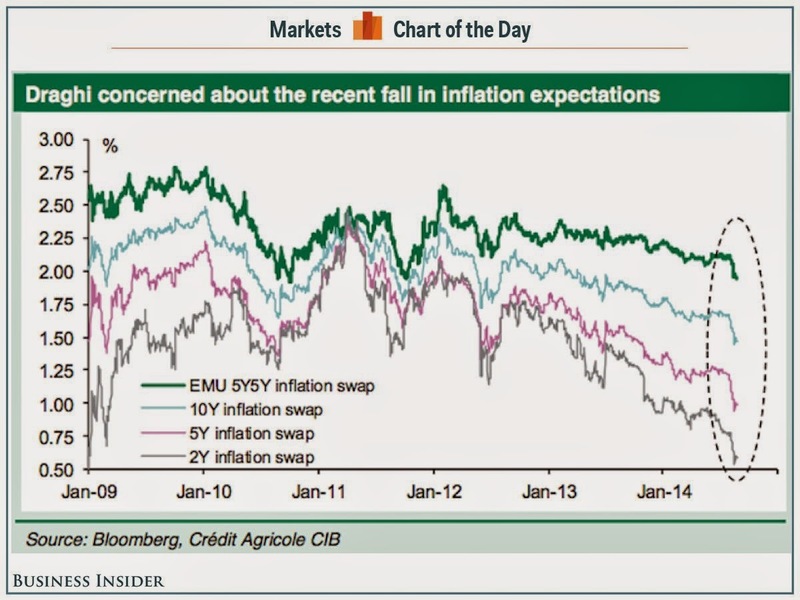 What you can see in the next graph is that inflation expectations have actually been declining quite fast. This probably was the reason Draghy changed his tone. Do you need a loan to pay debt, Pay bills, buy a new home and refinance your business? if yes, contact VICTORIA LAWSON LOAN FIRM VIA email: marianlawson@outlook.com for easy and fast loan amount transfer. When i could not face my debt and i need a hug money for hospital bills, to get a home improvement and to refinance, i came online to search for lender and i met how VICTORIA LAWSON company had help several person. i immediately contact her company with my details and my loan amount was approve within 48hours and i receive the credit in my bank. contact VICTORIA LAWSON LOAN FIRM with (marianlawson@outlook.com) For fast approved loan. Interesting explanation. I never even thought about that before that way. Anyway, you are doing such a good work here, I am looking forward to reading more of your theories. Thanks. Thank you for sharing! It's nice to find the information.